Though the first month of 2015 is still young, we have already seen some fantastic catches here in Key West. The prime fishing conditions and good weather have surely aided in this. Some of the best catches of the week were reeled on in our Key West deep sea fishing charters. 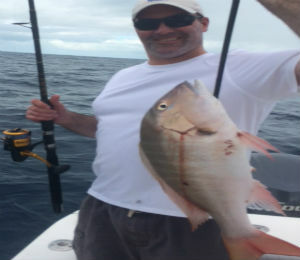 While it was initially difficult to decide which of the many catches would be the catch of the week, it was soon clear that the Red Snapper haul that was caught by Nick from Delray Beach, Florida was impressive enough to be the latest Key West Catch of the Week. In general, this beautiful fish is one of the most prevalent species of fish in the waters of Key West, though they can be tricky to catch. The Red Snapper is one of the most colorful fish that can be spotted when fishing in Key West, as their bodies are typically covered with a bright red hue. When fishing for this species of fish, it's wise to travel to reefs in order to catch one, as this is where they tend to make their habitats. The Red Snapper is popular not only as a game fish, but also as a food fish, as their meat is some of the tastiest around. When attempting to catch a Red Snapper or two, it's important to apply a deft touch to the rod, as Snapper like to nibble and pick at the bait before committing to biting on it. This fish is primarily identified by the red hues mentioned previously, as well as their sloped bodies and dorsal fins. The Red Snapper also has extremely sharp teeth. This species of fish can range anywhere from around one foot in length to just over 3 ft. They average around 10-40 pounds, though there have been catches of Red Snapper weighing above a massive 80 pounds. These fish can be caught in waters of any depth, though are found primarily when Key West deep sea fishing. They also swim in schools often, especially when resting at reefs or shipwrecks, making it possible to catch a number of them in one trip. The type of food that a Red Snapper will eat all depends on the age in which it's at, as food preferences change depending on their maturity level. They can eat pretty much anything, especially crustaceans and smaller fish. As such, they will bite at almost any type of bait, whether live or cut bait, even artificial lures. This gives anglers a decent advantage after spotting a Red Snapper. Once hooked, they don't put up much of a fight and are relatively easy to reel in. The warmer temperatures and good weather conditions likely helped when Nick was catching this fish, as they prefer warm waters. If you want to attempt to best Nick's catch and earn your spot as the Key West Catch of the Week, swing by anytime and hop on one of our fantastic Key West deep sea fishing charters.